Product Description: This kit will automatically lockup the torque converter on a 700 R4 transmission, without need of a computer. This type of torque converter lockup system is often used when an older, non computerized engine, is hooked up with a newer computer controlled transmission. The lock-up will occur in fourth gear and has the capability of locking up the torque converter in second and third gear, say for towing. 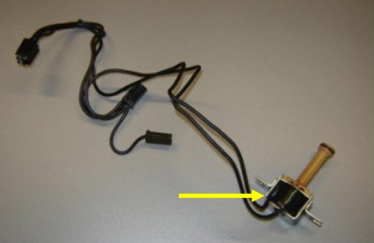 The kit includes a wiring harness, a replaceable transmission solenoid as shown by the arrow on the left, the electrical connections, and directions. During the installation, the transmission oil pan will need to be removed as well as some of the electrical wiring. The old solenoid is then removed and the new solenoid installed.